It wasn’t long ago that fancy twin monitor sets ups were the sole preserve of hotshot traders, high-flying graphics pros and, err, security guards, but recent price crashes have seen LCD multi-screen set ups becoming more affordable. Although all flavours of Windows come with basic twin monitor support as standard, it’s a bit of a clumsy solution, leaving the task bar stuck to the primary monitor, and all the open app tabs shunted onto the one screen. As a result, keeping track of all your open applications over two (or more) screens can soon become a right ruddy pain. Ultramon is a smarty-pants application that promises to sort out your desktop chaos, making it a breeze to work with multiple displays. With support for more than ten monitors, UltraMon adds a raft of user-configurable tools to help users get a manly grip on their unruly acres of screen real estate. The program extends the taskbar across each monitor, and each taskbar only shows tasks from the monitor it is on – so you won’t have to rummage around a single taskbar looking for wayward apps any more. If you drag an application to a different monitor, its taskbar button will immediately be moved to the corresponding taskbar. Neat. Moving programs around the screen is also made easier with the addition of two new buttons to the title bar of each open app. These little fellas let you quickly move programs across to other screens with a single click, or maximise a single window across the entire desktop. Shortcuts can be configured for moving and maximizing windows, with UltraMon’s full range of options available by right clicking on the icon in the taskbar. Amongst its multifarious options, you can create shortcuts that open programs on a specific monitor or in a specific position, or even configure the program to change the display settings before launching an application and then restore them when the program is closed. These settings can also be configured by opening the properties of an existing Windows shortcut and fiddling about in the new tabs added by UltraMon. Keyboard shortcuts can be set up for moving and maximising screens, with ‘display profiles’ letting you quickly change the settings of one or more monitors for each user. 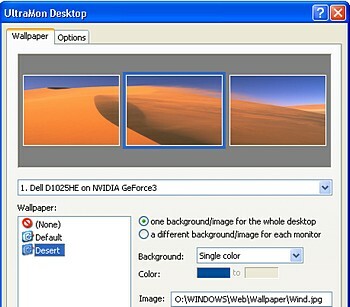 The program also lets you stretch desktop wallpapers and screen savers across multiple screens or set a different picture and screen saver for each screen. After running UltraMon for just a few minutes, the clunky, fiddly way Windows handles multiple monitors feels hideously unappealing, although UltraMon’s distinctly upmarket price tag of $39.95 may make you grit your teeth a little longer. If you own a multiple monitor user set-up and are something of a power user, routinely spawning new programs windows with gusto, then we’d say it easily justifies the cost – otherwise check out the free alternatives below. There are other less pricey options available – there’s a program called ZBar which is simple and effective, and you can also check out other possibilities in this forum discussion here. 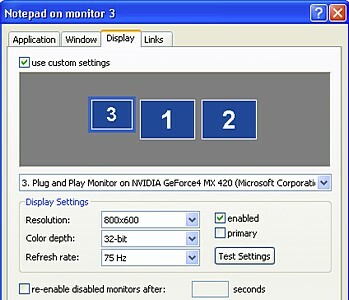 My personal recommendation is Actual Multiple Monitors (http://www.actualtools.com/multiplemonitors/). It is a most powerful utility among others and it works fine under Windows 7.